When you create your events there may be specific information that you need to capture from your registrants. Event Espresso lets you capture information with Questions and Question Groups. What are Questions and Question Groups? Questions –an individual question such as “How much do you weigh?”. How do I create Questions and Question Groups? By default Event Espresso has a number of Questions already set up, and two default Question Groups. These are the Personal Information (name and email), which cannot be removed and is required; and the Address Information, which cannot be removed, but it’s use is optional. Both of these are suitable for basic events. You can create/edit Questions in your WP Admin > Event Espresso > Questions and Question Groups at WP Admin > Event Espresso > Question Groups. If that info is all you need, move on to the next step, Creating a New Event. Otherwise you may need to add some questions and a new group. In the navigation WP Admin > Event Espresso > Menu click Questions and then click Add New Question. Fill out the question details and hit Add Question. Do this for as many questions as you need. 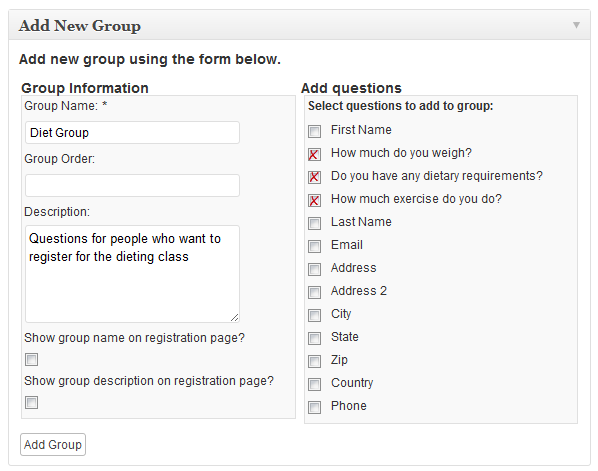 Once done, head over to Question Groups, and click Add New Group. Give the group a title and from the list on the right, tick the questions you want included. For now this will just be the questions you just made. Then click the Add Group button. Awesome. Now onto the main event, how to Create a New Event.